I know I bang on a lot about the interaction between price and the FLD, so I will keep this short and sweet. 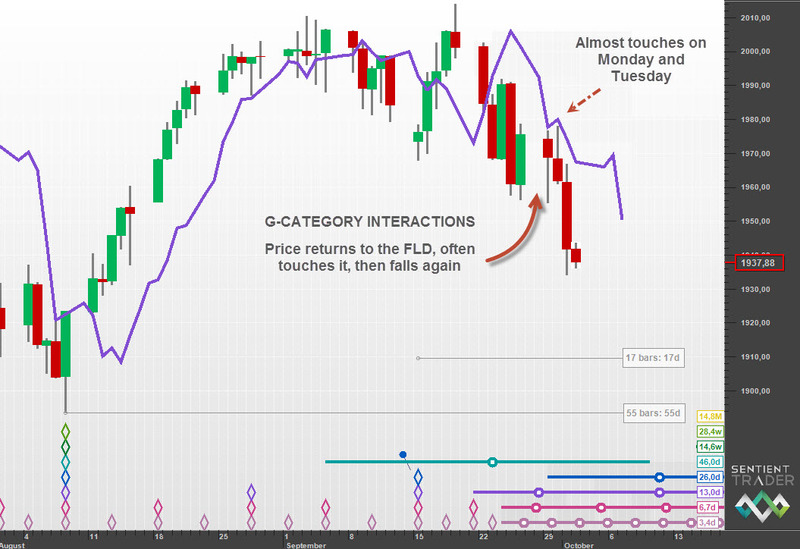 Last week I wrote about the F-category interaction that happened in the S&P 500 between Monday 22 September and Tuesday 23 September 2014. The G-category interaction occurs on the downside move towards the 80-day cycle trough. It usually occurs between 47 and 64 bars since the most recent 80-day cycle trough, and it is characterized by price moving back up to the FLD, often touching the FLD, and then resuming the descent into the 80-day cycle trough. Now price is falling into the 80-day cycle trough, and we need to stand by for that event. Be warned that occasionally price and the FLD will form a double G-H interaction, so we need to be careful of jumping into long positions prematurely. I think the current price action is still in an F category interaction. If a trough of 80 day magnitude forms now it will be a very short 40 day cycle going by the lengths of cycles in other indices (DAX and DOW). I believe the G interaction is due any moment and there will be a further fall subsequently for H. That could be the strong break of the 18 month VTL we need to see to confirm. Fascinating times. Yes I agree that the low for markets is lining up for next week at the earliest. I think a lot of players were looking to buy the trendline bounce from yesterday but are caught now. So a more severe shakeout could occur the next few days. TWT as always. Still looking for confirmation of a 40 week low. While yesterday’s low looks good on the face of it, it was a high volume test of support at the ES 1917 level. Yesterday’s low was 1918 which should and could be the low print, but with high volume on yesterday’s trade, it is a questionable test of that level. I expect to see that level tested again some time this month. The weekly looks the same. Getting long after we cross up over the 20 day FLD. I cant tell what the picture is either, regardless, long. 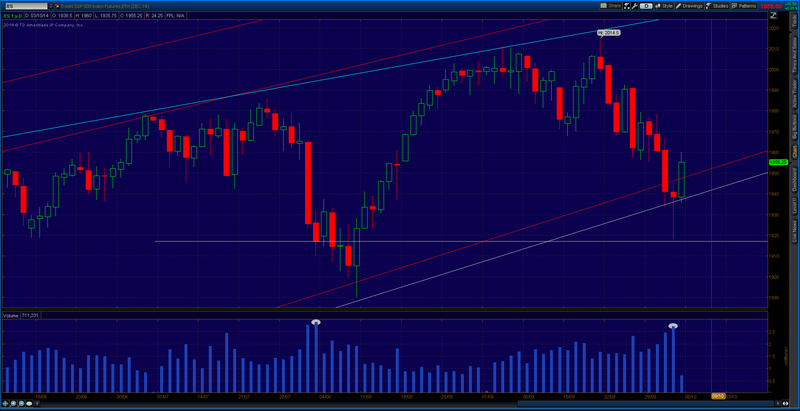 Wrt to the post of Oct. 3rd, ES is heading down to test the 1917 level again and this is on high volume. This test will likely fail (aside from yesterday’s dramatic bounce) and we will see lower levels for ES this month.